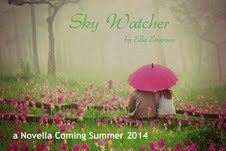 Sky Watcher will be available soon!! We head outside; the sun is shining, warming my chilling skin. 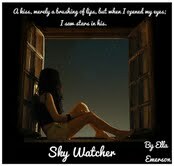 It feels so good; I raise my head towards the sky, soaking in the suns heat. We begin to head out towards the lake, taking our time, enjoying natures sounds that fall between us. I look to him, out of the corner of my eyes, taking in his masculinity, the way his muscles move together, forming the flawless body. He walks with the confidence of a man who knows his place in the world, having all the answers to life’s little questions, how does he makes it look so easy. I turn to him and smile, letting him know I am present, lost in thought, but still here. He looks over to me, seeming to be lost in thought as well. He stops, when we are nearing the big willow tree. Not really waiting for my answer, he motions for me to sit down under the sizable tree. 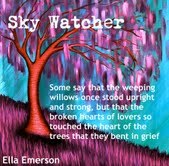 “Do you know the legends associated with the Weeping Willow trees?” he asks. “Well is it everything you have dreamed it would be?” I ask.